This is my first blog post of 2015, but as you'll have seen on the rest of the site and elsewhere, my lack of blogging has not been due to a lack of activity. On the contrary, I have been busy working on new books and projects that have taken my attention since the start of the year. In January I published 'The iPad Model Classroom', an interactive textbook that collates much of the work I have been doing with iPad and education over the past few years, particularly in relation to what I have presented at conferences and workshops. You can read more about the book, and download a copy of the iPad Task Planner that I present in the text, from my Books page. This past week I published another book in collaboration with a friend and colleague, Heath Wild. That book is 'Minecraft In Your Classroom', an interactive textbook that demonstrates how classroom teachers can use the incredibly popular iPad app Minecraft as a rich pedagogical tool. Dozens of lessons plans, ideas and work samples for all the Australian Curriculum learning areas are presented throughout the book, as well as content pertaining to how Minecraft can be used to meet core competency goals of students. We were fortunate enough to be able to launch the book at the #FutureSchools conference, and we look forward to running workshops in the future on further creative ways to utilise Minecraft in your classroom. Yesterday afternoon my daughter, wife and I decided to make some art in the backyard. While they pottered with clay and found objects, I decided to play around with two iOS art projects. The first was based off an idea that a colleague at Autism Spectrum Australia, Leith Hamilton, had regarding our new Sphero robot balls that our school received as part of an educational collaboration between Sphero and the Apple Distinguished Educators program. Leith's idea was a simple one that I think will be a blast with many of our students - to dip the Sphero covers in paint, and then drive them over a big piece of paper to create an artwork. I've been wanting to do some more Sphero art for a while now - one of the projects I'm trying to make some time for is to capture a night time illuminated Sphero art session with a long exposure capture on my camera, there are some tremendous potentials there. However, this paint project is perfect for schools, so I set about experimenting. The second project I played with utilised the new Osmo app 'Masterpiece', which I will discuss further below. The premise for this Sphero paint project is simple enough, however the potential for myriad designs and outcomes are great, with scope for advanced extension opportunities depending on the lesson focus. 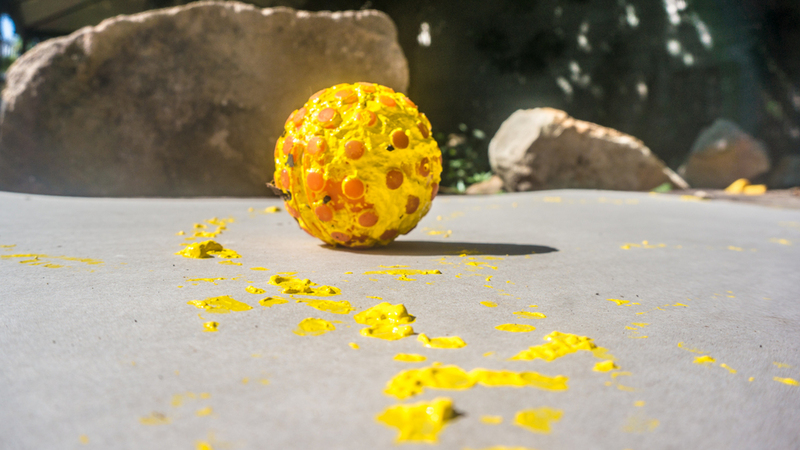 Consider a spectrum of lessons ranging from a sensory exploration activity where students roll a Sphero around the paint and then describe the textures that result on the paper when Sphero is driven around the surface, through to multiple students operating multiple Spheros at once with different colours coming together in a varied combination of painted trajectories, through to programming Sphero using the Draw N' Drive or MacroLab apps to paint specifically designed shapes and lines on a large surface. See the photographs below from my brief experiment - the textures left behind from the different Sphero covers made me think of Australian indigenous art, particularly the map making focus, with dot painting and varied styles utilised to depict different land elements and topographies. Creating a map of the neighbourhood using Sphero and paint could be an awesome school art activity, I'm going to give it a try and report back the results. The other art experiment I did was with the new Osmo 'Masterpiece' iPad app that was just released the other day. It uses the existing Osmo hardware to allow you to take a photograph of something you would like to draw, and then the app will create a line drawing version of the photograph. Then, with a blank piece of a paper and your pencils in front of you, the Masterpiece app will overlay the line drawing on top of your piece of paper, as shown on the iPad, allowing you to see how to draw the picture on your piece of paper as you watch your pencil 'trace' the image on the screen. Check out this ad for Osmo to see a fantastic example of how it works: 'Masterpiece for Osmo'. I showed my daughter the templates the app comes with for drawing plants, animals and a variety of other object categories. She was a little shy and wanted to see what I could come up with first, however she was eager to photograph our pets and see how they looked in line art version, which I could see inspired her to think more about it for when we have another go later. I tried a few of the templates the app comes with and found it to be just incredible - my only success with drawing in the past has come about through photographing an image with my iPad, then using an app like Sketchbook Ink to trace over the top of the photo, so to have an app that allows me to take a photograph with my iPad and then draw and paint on a piece of paper or a canvas is a huge source of excitement for me. The app accurately reflects your hand as you draw and trace the on screen image, and while I only had time for a few quick sketches I am very keen to try creating a more detailed image shortly. You can see in the image below I photographed my wife working, then I adjusted the way the line drawing presented on the iPad, and started to create my own version. Again, this app is one that would be such a tremendous classroom activity, particularly for individual project time for students. As an art tuition process I see this as being very powerful for students who have a special interest in this area. Our school has quite a few Osmo sets now, so I'll be very keen to announce this new app to staff next week and see what sort of creations our students can conjure. For some more iOS art experiments, my Vimeo channel has a few tutorials I have uploaded over the past year. Check out this recent one using Brushstroke and other apps to create some quality painterly compositions. As well, don't miss the amazing art that Cathy Hunt, fellow Apple Distinguished Educator, creates on mobile devices at her iPad Art Room website, or her fantastic books on the iBooks Store.